A Hard Cheese Grater and Serving Device In One! 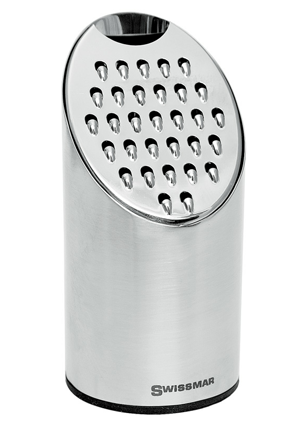 This high quality grater allows you to shred your favorite hard cheeses, and then serve them using the same great tool. It is ideal for dinner parties, or to set out on the table any time you serve pasta, soup or salad. 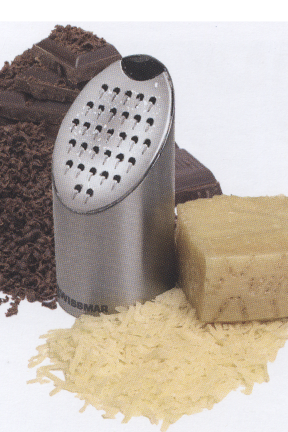 The Grate and Shake provides a simple solution so that it is easy to serve freshly grated cheese at any meal. It is almost as easy as using a store bought tub, but fresh cheese is way more flavorful, and this container is much nicer to look at. The Grate and Shake has a stainless steel, grating surface at the top that will easily shred any hard cheese like parmesan and romano. It can even be used to grate chocolate for use as a gourmet dessert topping. As you use it, all of the cheese is collected in the stylish container below. A small opening at the top of the unit allows you to tip the grater over and shake out cheese as needed once you are done. 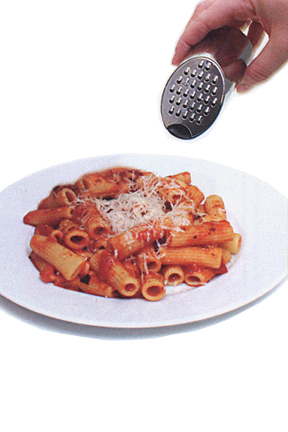 The integrated pouring spout makes it easy to add just the right amount of cheese, directly onto your food. When it comes time to clean it, simply remove the silicone base for easy access to the interior of the grater. Made entirely of 18/8 stainless steel, and elegant enough to match tabletop decor, this grater would make an excellent addition to any household. Simply grate enough cheese for your meal, and then bring it to the table to be sprinkled freshly onto each individual plate. It is the perfect compliment for when you serve classic Italian dishes or tossed salads. Fresh cheese adds an extra special touch that powdered versions in plastic containers just can't match. You will impress friends and family members with your unique kitchen gadget, and better tasting dishes all at the same time. Grate your cheese in the kitchen and then bring it into the dining room to be served as needed. It is a simple solution that requires little effort, and cuts down on unecessary dishes. This little gadget is so convenient you will be eating freshly grated cheese more often than ever. Swissmar has been providing quality products and service at affordable prices for more than 20 years. They produce high quality cutlery and kitchen utensils that hold up through years of daily use. Thanks to clean, classic designs, Swissmar tools never go out of style, and never lose their place in your kitchen. Using quality materials and reliable designs, Swissmar brings gourmet cookware to European and American homes. Order Yours Today! Swissmar Grate and Shake - Grate cheese and then serve it using the same kitchen gadget. A great addition to any kitchen. where is the Grate and Shake manufactured? All Natural, Gourmet Mustard from Naples Valley New York. 9 Piece Microwave Cooking Set. For Home Cooked Meals In Minutes! Incredibly Sharp And Precise. Advanced Blade Never Gets Dull!